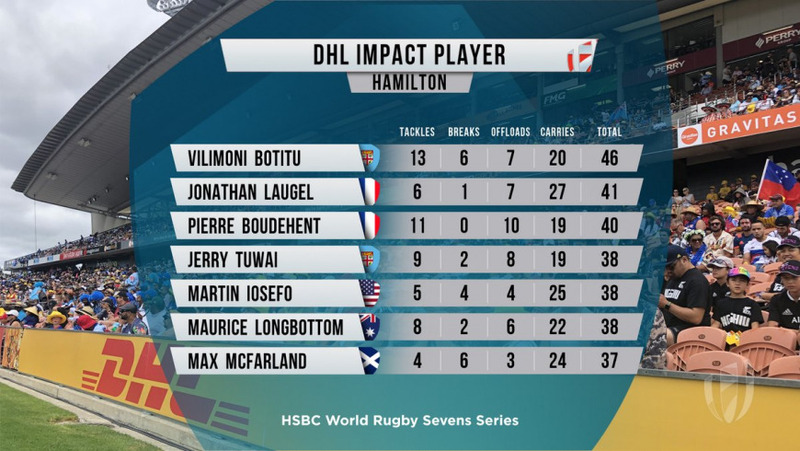 Vilimoni Botitu’s impressive stats make him the DHL Impact Player at the 2019 Hamilton Sevens. The dazzling skill of the entire Fiji Sevens team led do a dominant Cup victory. 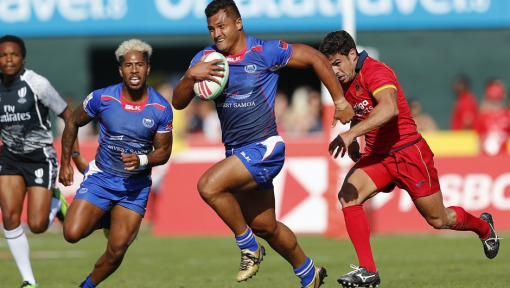 It’s safe to say that the Fiji Sevens rugby team left an emphatic mark on the HSBC World Rugby Sevens Series 2019, not to mention the entire rugby world, this weekend at the HSBC New Zealand Sevens tournament. If 38-0 in the Cup final against the USA, a team competing in their third final match of the season, doesn’t scream DOMINANCE then we don’t know what does. 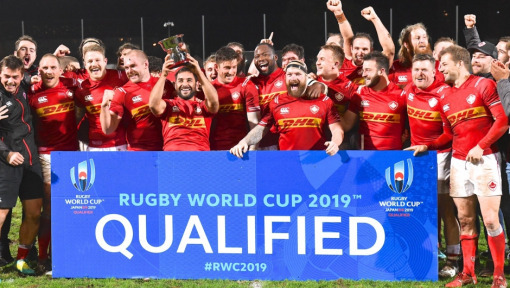 And that’s not even counting the crushing 33-7 win over Canada in the Cup quarter finals and the demoralizing 29-7 defeat of defending New Zealand Sevens champions, South Africa, in the semis. Interestingly – and fittingly – enough, it was an Australian who topped the #DHLImpactPlayer Performance Tracker on day 1, which just happened to be Australia Day. Now that’s how you say Happy Australia Day to rugby fans down under! After the final whistle blew on Sunday, it was no surprise that a Fijian stood atop the DHL Performance Tracker. Vilimoni Botitu chalked up some big numbers, scoring a total of 46 points off 20 carries, 13 tackles, 7 offloads and 6 line breaks. The stats tell the story of a complete player – with incredible skills on both offense and defense. And one who can offload with the best of them. In fact, Botitu’s beautiful backhand to the inside after he broke up the right against Canada was arguably one of the most impressive offloads of the tournament. Though France struggled to find their footing most of the weekend, the French duo of Jonathan Laugel and Pierre Boudehent left a large footprint, scoring 41 and 40 points respectfully. Laugel led the leaderboard on carries (27) while Boudehent made the most offloads (10). Laugel’s results move him into fifth place on the overall DHL Performance Tracker. Botitu’s award-winning performance moved him onto the overall leaderboard as well, where he sits in ninth place at 102 points. Right now the man to beat is New Zealand’s Sione Molia. 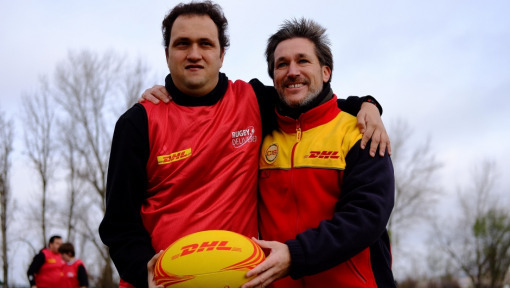 The All Black’s defensive rock (44 tackles) has yet to be named a DHL Impact Player this Series but has put up consistently solid stats at every tournament so far. 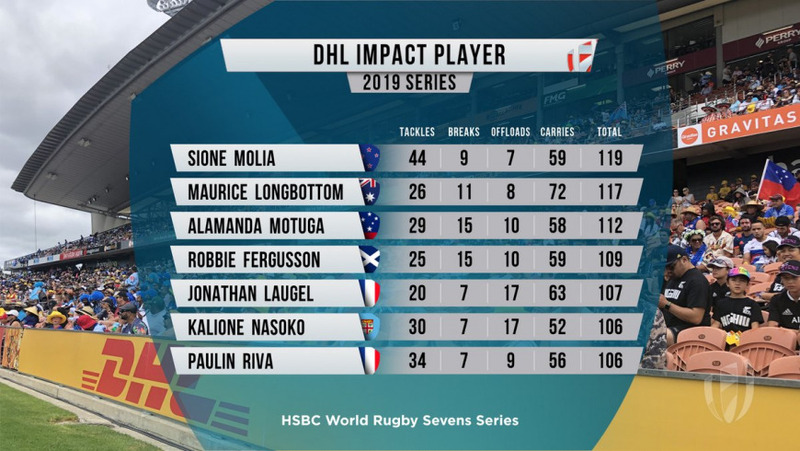 Australia’s Mourice Longbottom and Samoa’s Almanda Motuga (Dubai and Cape Town Impact Players, respectively) are on his heels at 117 and 112 points. Longbottom obviously loves the ball, leading the field with 72 carries. Fiji wowed the world in Hamilton for the second year in a row, producing what we’d call “poetry-in-motion” rugby en route to victory. 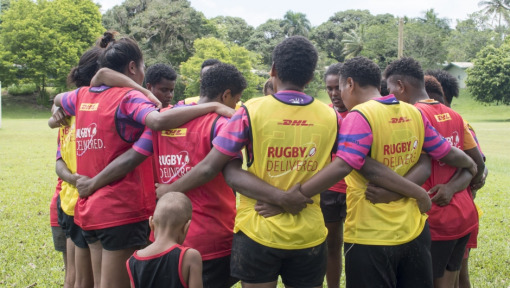 Although they outshined their opponents throughout the entire weekend, Fiji really dazzled in the Cup final – a performance that began even before the match started when the islanders lifted the official ball carrier into the air. Needless to say, Fiji had won over many in the crowd after that electrifying moment. And they carried that electricity onto the field, decimating the USA in a 38-0 victory – a back-to-back triumph that demonstrated once again that when at their best, the Fijians are almost untouchable. The USA reached their third final in as many tournaments but once again had to settle for Silver. But they certainly left Hamilton with their heads held high after producing impressive wins over Scotland and New Zealand on their road to the final. Most unsettling for USA Sevens is the rather big setback the team suffered with Perry Baker fracturing his jaw. 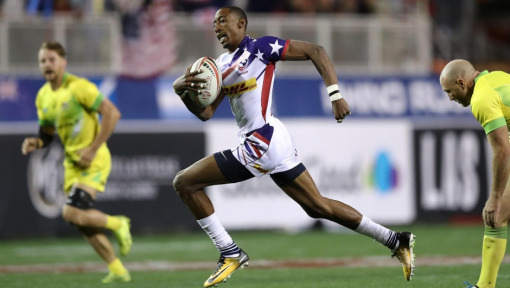 After sharing the Impact Player Award at the 2018 Dubai Sevens, the American speedster will now likely be out for Sydney and possibly Las Vegas as well. 🚨 WIN a trip to the USA 7s in Las Vegas on March 1st-3rd! 📲 Comment the answer to the question below to enter! 🤔 Which player won the #DHLImpactPlayer Award at the USA Sevens 2018? The tournament hosts took a respectable third place. After going unbeaten in the pool stages and beating Australia with relative ease in the quarters, they came unstuck against an in-form USA in the semis, before beating the Blitzboks 29-7 in the Bronze medal match. Scotland claimed the fifth spot, beating Samoa 24-19. And England won the Challenge Cup, overwhelming Kenya 36-7. With the action already set to begin in Sydney this weekend, the teams have had little time to recover and reset after an exciting an eventful tournament in Hamilton. Luckily the trip across the Tasman Sea is a short one. The squads have been confirmedand the teams are ready. 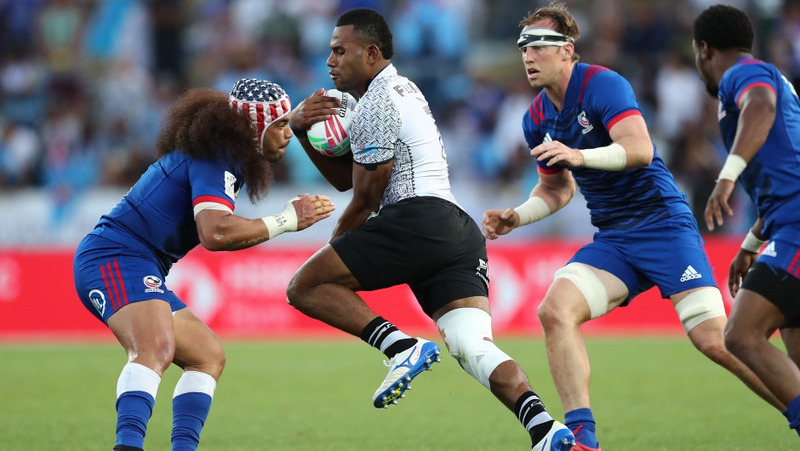 With Fiji seeking a third title in a row, USA chasing their first victory after three unsuccessful trips the Cup final, and hosts Australia expecting a lot of home-crowd support, this weekend is sure to be full of memorable rugby moments.